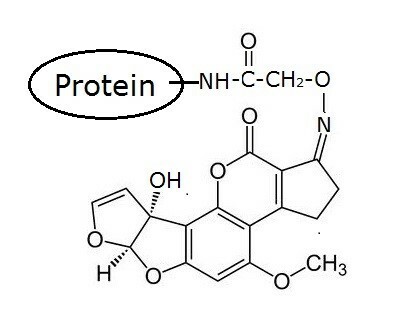 This product is Aflatoxin M1 to Bovine serum albumin (BSA). It is useful as an antigen paired with the anti-Aflatoxin antibody assay in both ELISA and gold colloid strip test. Figure 2. Elisa titer of AFM1-BSA. 2 mg/mL in PBS with 50% glycerol or lyophilized powder. Aflatoxin M1 methylcarboxyloxime linked to BSA via amine acylation. 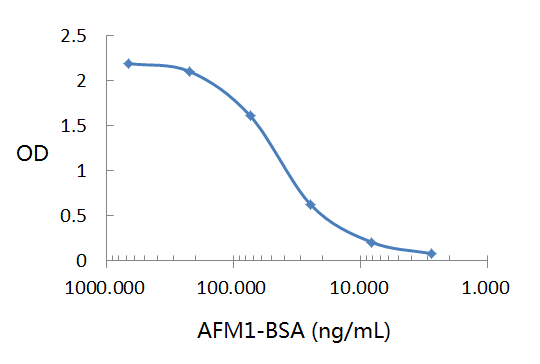 OD50 ELISA titer of AFM1-BSA is approximately 0.05 µg/mL.